The deal allows its subsidiary, Grupo Rosneft, to export gas produced at the Patao and Mejillones fields in the Caribbean Sea for the next 30 years. In a statement, Rosneft estimated the total reserves at the two fields to be around 180bn cubic metres (bcm) of gas. Maximum annual production is expected to reach 6.5 bcm in the first 15 years. 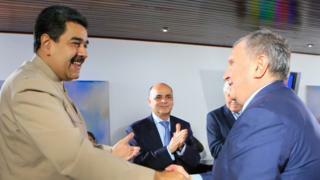 Rosneft chief executive Igor Sechin signed the deal during a meeting with Venezuelan President Nicolás Maduro in Caracas over the weekend. The state-owned Russian energy giant is already involved in a number of joint projects in Venezuela, including the Petromiranda, and Petromonagas fields, which are estimated to hold more than 20.5bn tons of oil. Venezuela owes an estimated $140bn (£103bn) to foreign creditors. Russian capital and cash have been helping to keep Venezuela afloat after its oil-based economy collapsed, hit by falling oil prices and revenues, and the plummeting value of its currency, the bolivar. Last month, Russia agreed to restructure $3.15bn (£2.4bn) in debt owed by Venezuela. The deal allows Venezuela to make "minimal" repayments on its Russian obligations over the next six years.